Saina Nehwal, India's lone hope for a medal in badminton, crashed out of the the Asian Games in Guangzhou after losing to Yin Pui Yip of Hong Kong on Thursday. The World No 3 lost 8-21, 21-9, 19-21, on a day that saw the end of India's badminton challenge at the Games. Earlier, Men's singles player Aravind Bhat and the mixed doubles pair of Jwala Gutta and V Diju lost -- Bhat losing 19-21, 12-21 to world number six Boonsak Ponsana of Thailand and Jwala-Diju going down to Koreans Baekcheol Shin and Hyojung Lee in the mixed-doubles event. A second medal eluded India in the swimming competitions as its men's 4x100m medley relay team finished a disappointing sixth in the finals at the Asian Games in Guangzhou on Thursday. The quartet of Rehan Poncha, Sandeep Sejwal, M Badrinath (who replaced Virdhawal Khade in the finals) and Aaron D'Souza clocked 3:52.97s. 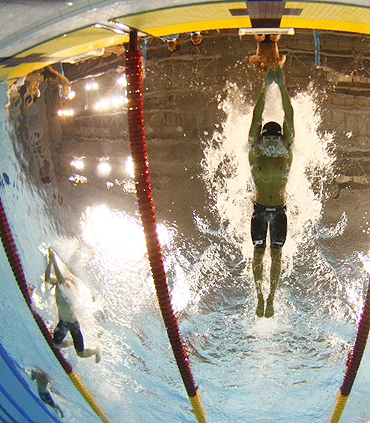 Japan was elevated to gold with a time of 3 minutes, 34.10 seconds, after China was disqualified from the men's 4x100-meter medley relay after an illegal change involving the second swimmer. India also tasted disappointment in the individual events on the day as Mandar Anandrao Divase (1500m freestyle), M Badrinath (50m backstroke) and Sandeep Sejwal (200m breaststroke) failed to make the final cut. India endured a dismal day in taekwondo competitions with as many as four players -- two men and as many women -- crashing out in the quarter-finals of their respective weight categories, in Guangzhou on Thursday. P Anand and Sandeep Kundu too were shown the door in the last eight stage of the men's 80kg and 87kg. P Anand lost 3-5 to Nabil Hassan of Jordan while Sundeep Kundu was spanked 4-18 by Uzbek fighter Akmal Irgashev. 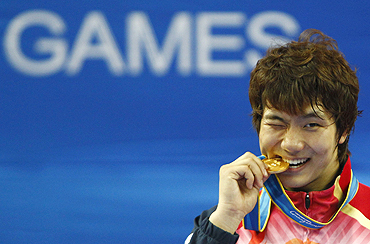 South Korea's Heo Jung-nyoung won the gold in the over 87kg category. Among women, India's Latika Bhandari and Y Shantibala Devi bowed out in the women's 53kg and 57kg respectively. Both Latika and Shantibala went down tamely 0-6 and 0-13 to Sarita Phongsri of Thailand and Hou Yuzhuo of China. Later in the day, Lee Sung-hye beat Yuzhuo in the 57kg category, to give the Korean squad their first gold medal. Taiwan President Ma Ying-jeou stepped into the politically-charged dispute over a disqualified taekwondo fighter on Thursday, demanding event organisers at China's Asian Games re-examine her case and offer a better explanation. Former Asian champion Yang Shu-chun was disqualified in sensational circumstances on Wednesday, when officials stopped her 49-kg bout against a Vietnamese competitor and disqualified her for wearing unauthorised sensors in her footwear. "Taiwan's public cannot accept this," presidential office spokesman Lo Chih-chiang said. "The president is asking the cabinet and the sports commission to stick up for her rights. We hope they can re-evaluate the case and offer better reasoning."